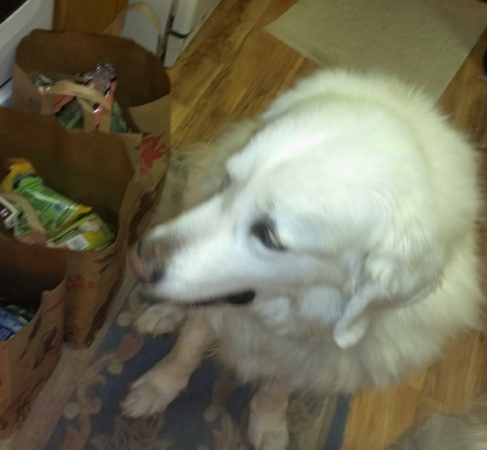 Here is a photo with Lilly and also with her pals, and a photo of Lilly guarding our groceries!. All three are rescues. She is the large Pyrenees with three legs who no one wanted. We took her from Great Pyrenees rescue of Montana. They brought her to Portland where we picked her up in 2008: she was originally from a puppy mill where she was totally neglected. She lost her leg due to the neglect: a tether was around her rear left leg for at least ten days before they noticed. The vet saved her and she was send to GPyrenees Rescue Of Montana. 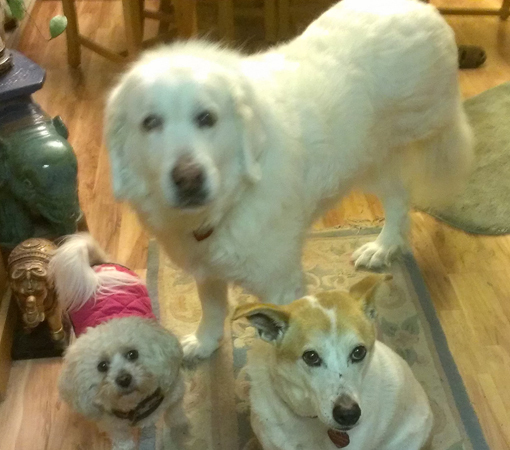 Lilly was a very special, extremely loving and sweet Pyrenees. She was active and walked with us to her last day: We did everything we could for her to the end. She died in my arms. We are still recovering from her loss. These rescued dogs have a special love.